Tour operates between 10:00am and 3:15pm. This tour runs year round but is best appreciated in the summer to enjoy the warm weather. 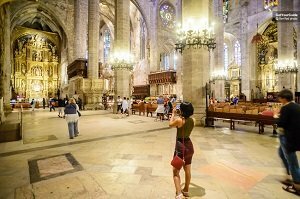 We are comparing Palma Cathedral & Diocese Museum Fast track Ticket Prices from leading ticket suppliers and Try to find you Cheap tickets prices on the market. The cathedral sits on a cliff top and its reflection can be seen in the Mediterranean Sea which is an entirely unique feature! Skip-the-line privileges means you don’t have to waist time queuing outside so it’s the perfect tour for those short of time. The Palma Cathedral is one of Palma de Mallorca’s most iconic and impressive buildings, it’s visited by thousands of tourists each year and is popular with the locals. The Diocese Museum sits in a 13th century bishop’s palace and displays an array of religious sculptures, paintings and artifacts. This tour provides a wonderful day out for culture vultures and historians alike and is the perfect way to spend your first day on the island. Your Experience With Palma Cathedral & Diocese Museum Fast track Ticket? Check out the cathedrals naves, imposing columns and impressive gothic architecture. Make sure you look at the cathedral’s reflection in the Mediterranean Sea. Next you’ll head to the Diocese Museum where you can explore religious artifacts and exhibits that are on display. Check out the arab textiles found inside, they date way back and are quite spectacular for the region. Spend the morning learning about the islands religious roots and history. What Palma Cathedral & Diocese Museum Fast track Ticket Includes? Arrive at the meeting point atleast 15 minutes before the tour departure time to avoid delays. The Cathedral and Museum can be chilly so bring a thin layer to wear when inside. Travelers Reviews about Palma Cathedral & Diocese Museum Fast track Ticket? To skip the line at the cathedral you must enter via the security enterance. Meeting point: Security Entrance Gate, Palma Cathedral, Plaza de la Seu, 07001, Palma.